I had 2 great days in Moncton last week getting Accounting training. I have been using Simply Accounting for the past 3 years but it's always good to get a refresher course...I got lots of great tips and tricks to save time. Don't you just love that!!!! Saturday was an amazing day for teenagers here in the community. I participated in a SCRAPBOOK FOR SELF-ESTEEM event. The girls made a scrapbook of themselves, had their hair done, manicures, pedicures, different activities...and soooooo much more. Wow!!! Thank you to everyone who made this day possible!!!! The girls sure had fun and well of course the adults too. All you need is your adhesive...i supply the rest. How cool is that!!!! Hurry in because there is limited spots. Looking foward to seeing you!!! The 1st 6 people to come in the store Tuesday may 26th will be able to make a quick 1page layout for only $5.00. The 1st 7 people to come in the store Thursday may 28th will be able to make a quick 1 page layout for only $5.00. DON'T FORGET TO REGISTER FOR THE JUNE 27th ALL DAY CROP. SPOTS ARE FILLING UP QUICKLY!!!!! We only have 8 spots left...HURRY send me an E-MAIL. 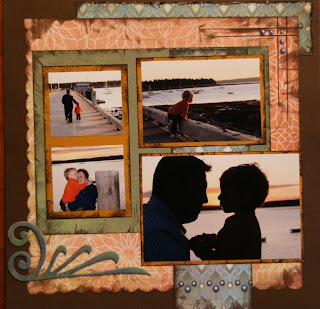 Top SIX reasons to go to an ALL DAY SCRAPBOOKING GONE WILD CROP!!!! 6. No interruptions from children, husbands, telephone...etc. The only interruptions you will have are MEAL TIME or PRIZE TIME. 5. 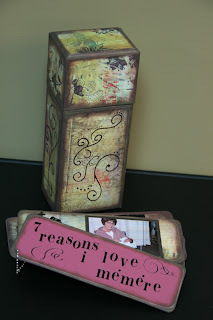 Have the opportunity to use tools you don't have: Cricut, Big Shot and Big Kick, lots of Punches, Stamps...and more. 4. No COOKING! All meals and snacks provided. 2. You are telling your life story to future children, grandchildren and great grandchildren. You deserve to get WILD!!! That is it for now. Hope to see you soon. CONGRATULATIONS ELIZABETH HENDERSON FOR BEING OUR RANDOM WINNER FOR POSTING A COMMENT ON THE LAST BLOG POST. JUST COME AND SEE US AT THE STORE TO CLAIM YOUR PRIZE. - Sign up for a class and receive 25% off any regular priced item in the store bought that evening. - Sign up for a Friday night CROP TILL YOU DROP for only $15.00 now, and receive 10% off all your regular priced purchases that evening. DON'T FORGET TO REGISTER FOR THE JUNE 27th ALL DAY CROP. SPOTS ARE FILLING UP QUICKLY!!!!! We already have over 35 PEOPLE signed up...HURRY send me an E-MAIL. I am looking outside as we speak and the sunshine is finally coming out. It's been cloudy and rainy pretty much all week here. Nothing else to do than scrapbook right!!!! I just love the MOTHER'S DAY BOX i made a class last night. I hope my mom is not reading my blog because she will see her gift before she gets it...lol I still have 1 more box left if you want to make a nice gift for someone. I hope you had a wonderful NATIONAL SCRAPBOOK DAY!!!! I sure did at the Creative Scrappers all day crop. Thanks Kristine for a wonderful day and yummy food!!! I have been to 2 crops in the last 3 weeks and have been able to get some layouts done while giving demos. Lots of fun!!!! I just love doing demos on different products. 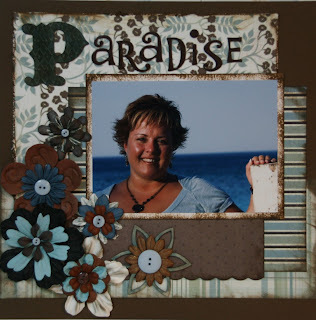 I know I have an addiction to scrapbooking products...but you know what...i am not the only one...lol I just love using Perfect Pearls that you can see on the chipboard embellishments on the sunshine layout and the wooden flower on the Paradise layout. LEAVE A COMMENT...TELL ME WHAT YOUR FAVORITE PRODUCT IS AND GET A CHANCE TO WIN A PRIZE. 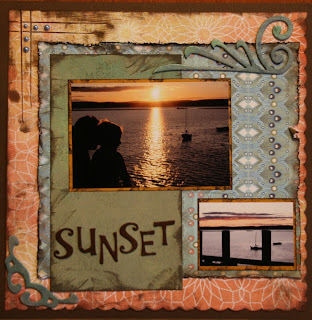 Congratulation to Jodi for being our random winner for posting layouts in our GALLERY. Don't be shy...post your layouts. We will have a random winner each month for those who post. LUXE "TO DIE FOR JOTTERS"
We need to make room for new products coming in the next few weeks. DON'T FORGET TO REGISTER EARLY FOR THE JUNE CROP. SPOTS ARE FILLING UP QUICKLY!!!!! We already have over 25 people signed up...HURRY send me an E-MAIL.